If you own Call of Duty: Ghosts you will already know that the aliens have landed as part of the game's Extinction Mode. With only one map currently available, it is about time some DLC was released to rectify things. 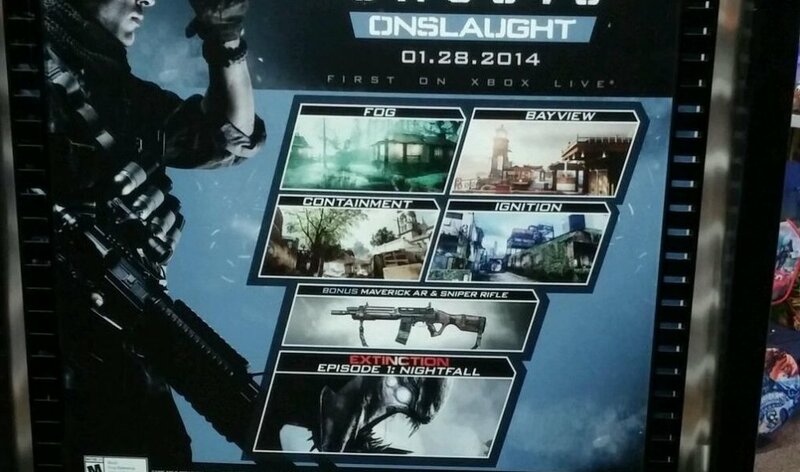 Behold Onslaught, coming January 28th on Xbox One and Xbox 360. Like with so many CoD stories there is a mixture of fact and fiction with what is going on. We know that the DLC will initially be exclusive to Microsoft platforms, later to be released elsewhere, and that a new Extinction Mode map called Nightfall will be available. This map will center around a mysterious swampy bog and have a new enemy type called spiders. Oooooooohhhhhhh Spiders! The other elements of the DLC are more conjecture, but according to one Twitter user there is a GameStop advert stating that the maps are; Fog, Containment, Bayview, Ignition and Nightfall. The advert also says that a bonus sniper rifle and Maverick AR will be included. The cover image for this story suggests that they may just be right, but you have burned us before Activision. What ever the truth is, the important things for Co-Optimus fans is that the 6 player co-op mode will have a new map to play. So get ready to lock and load, this is going to be more than just a simple bug hunt. Page created in 0.2399 seconds.